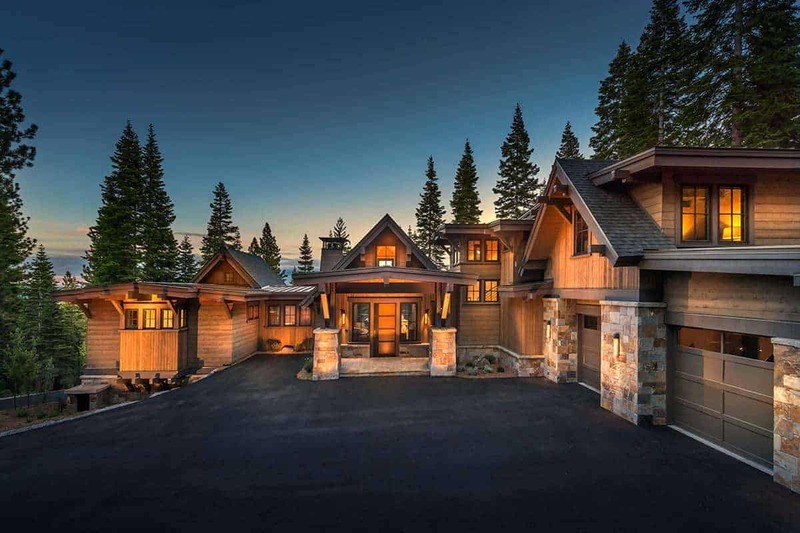 This rustic mountain home was custom designed by Lot C Architecture in collaboration with Sarah Jones Design, located in the community of Martis Camp, Truckee, California. 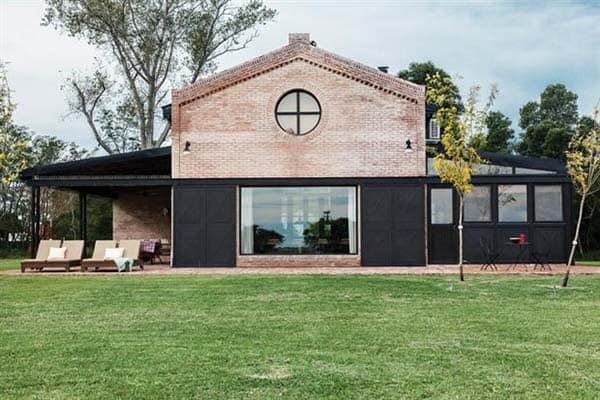 This residence encompasses 6,794 square feet of living space with six bedrooms and five-and-a-half bathrooms. From the exterior of this home, a striking deck that juts boldly northward is a gathering of elements that redefines the notion of a modern, grand lodge. 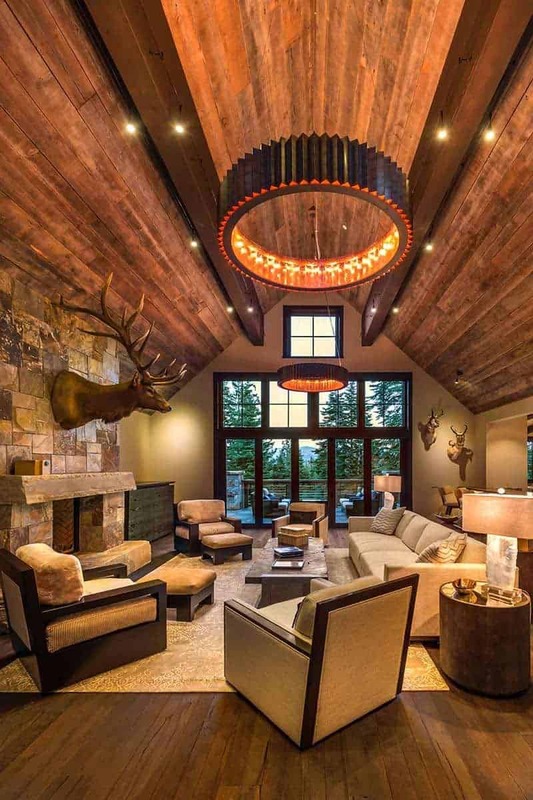 Just beyond the front door of this grand home is the great room, featuring distressed wood flooring, towering, wood beamed ceilings and sight lines that connects you beyond to the pine bar and stone fireplace towards a deck that’s ideal for entertaining — or enjoying a cup of morning coffee. 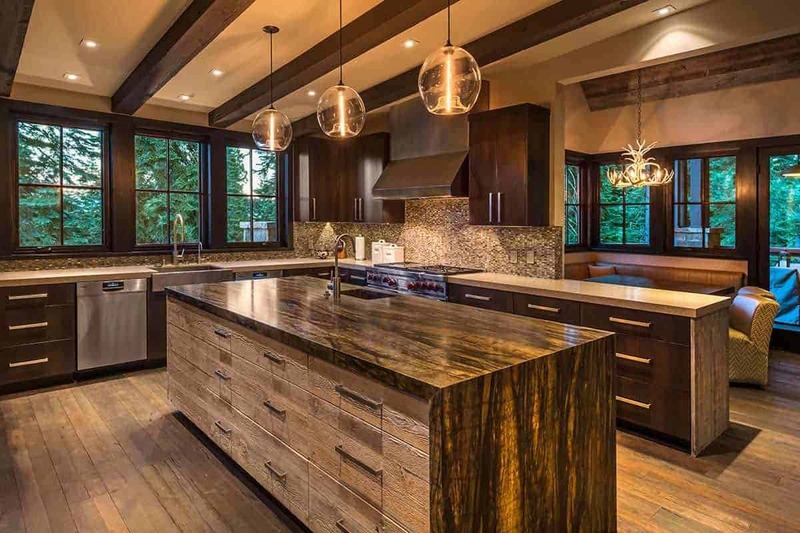 Just off the great room is a beautiful kitchen with a generous center island and plenty of storage and working space. 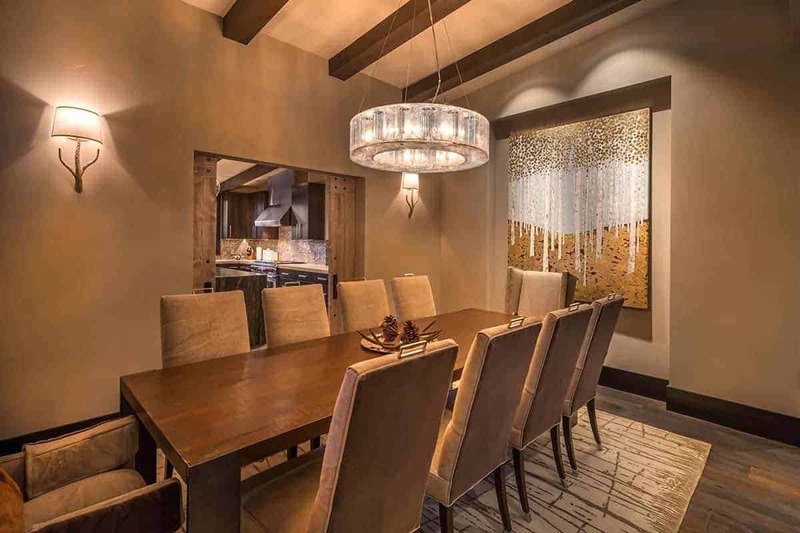 The dining room is ideally next to the kitchen, yet can be partitioned off for intimate gatherings. 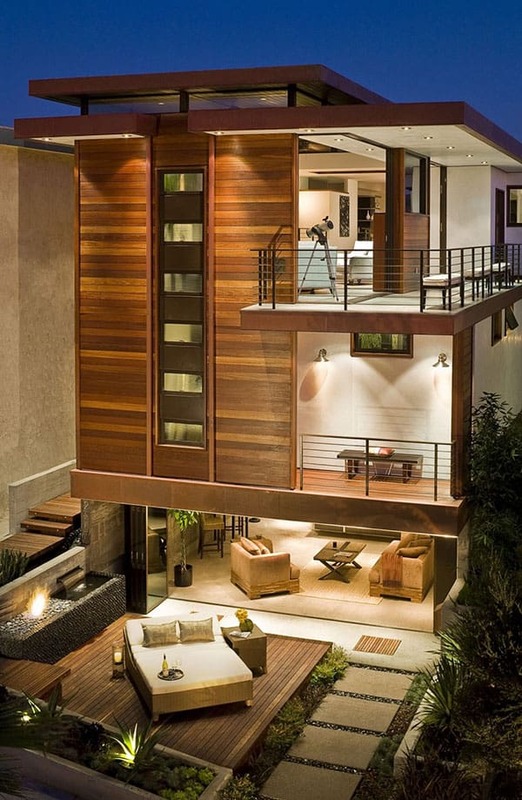 This fabulous home backs to open space on one side, while boasting mesmerizing views of the Carson Range on the other. This mountain range is part of the spectacular scenic wonder of the Tahoe area. 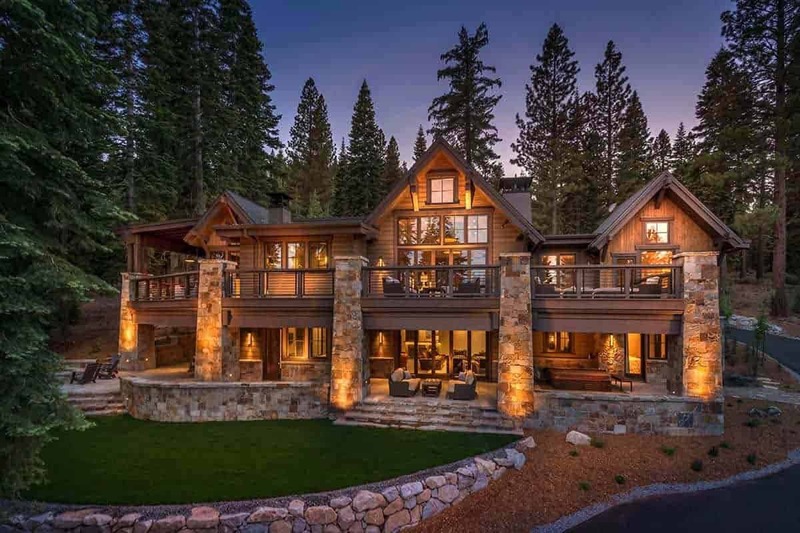 Need To Know: If you are loving this fabulous home, we spotted it listed for sale on Tahoe Mountain Realty — $7,300,000. 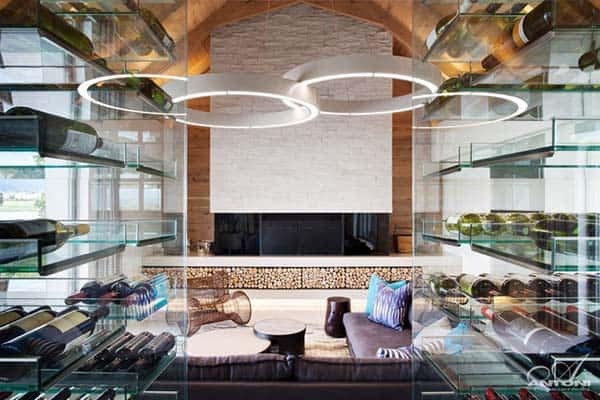 Above: The ceiling is reclaimed barn wood from an old Californian barn. It was sourced from Westgate hardwoods. 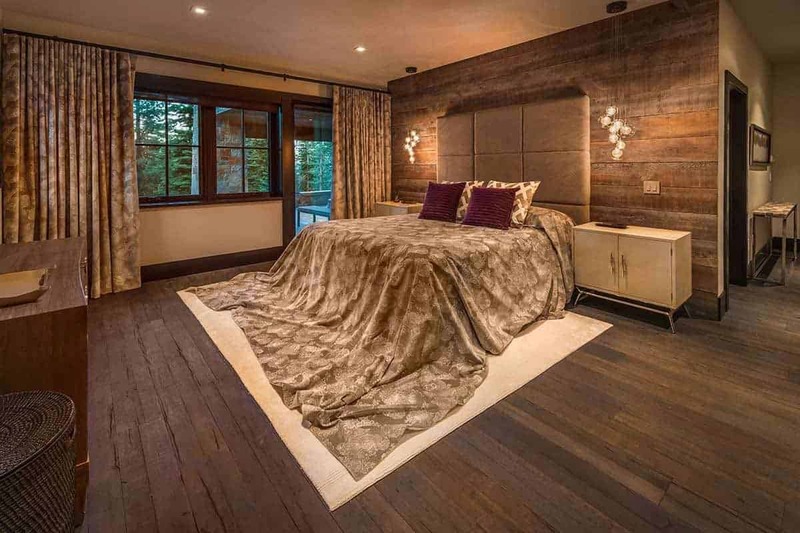 The hardwood flooring is Coal from The Heritage Timber Collection by DuChateau. 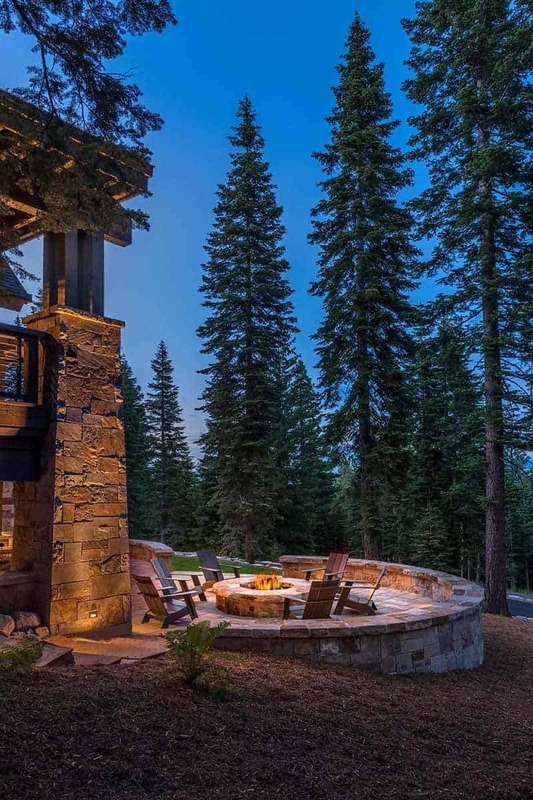 What We Love: This gorgeous rustic mountain home offers some phenomenal privacy along with idyllic peak views of the Carson Mountain Range. 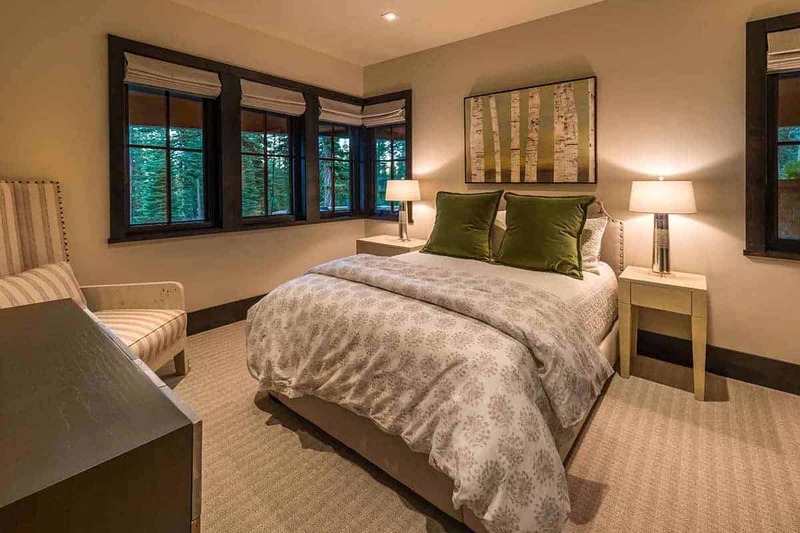 The master bedroom suite offers a relaxing oasis after a long day of outdoor play, while the large guest suites and bunk room and ideal for hosting overnight visitors. Generous outdoor spaces are another fantastic feature of this home, providing plenty of space for entertaining guests, with a patio, hot tub and covered outdoor kitchen… Readers, please share with us what details in this home caught your eye in the Comments below! 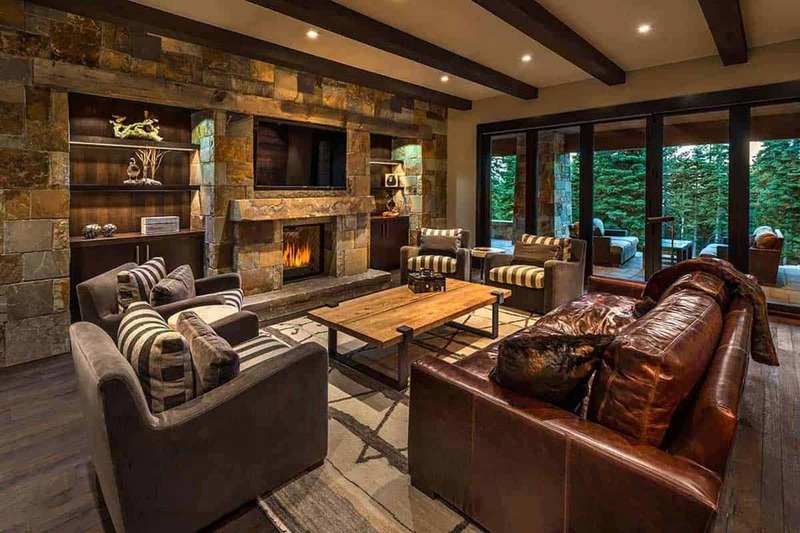 Note: Have a look at a couple of other incredible home tours that we have featured here on One Kindesign from the interior designer of this project, Sarah Jones Design: Warm modernism takes center stage in Martis Camp retreat and Gorgeous rustic mountain retreat with stylish interiors in Martis Camp. 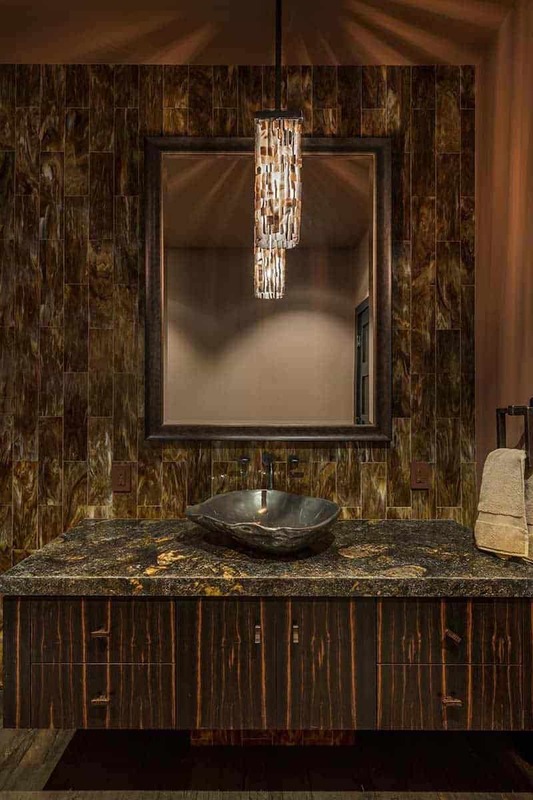 Above: The kitchen features beautiful craftsmanship and high-end amenities such as Wolf, Bosch and Sub-Zero. 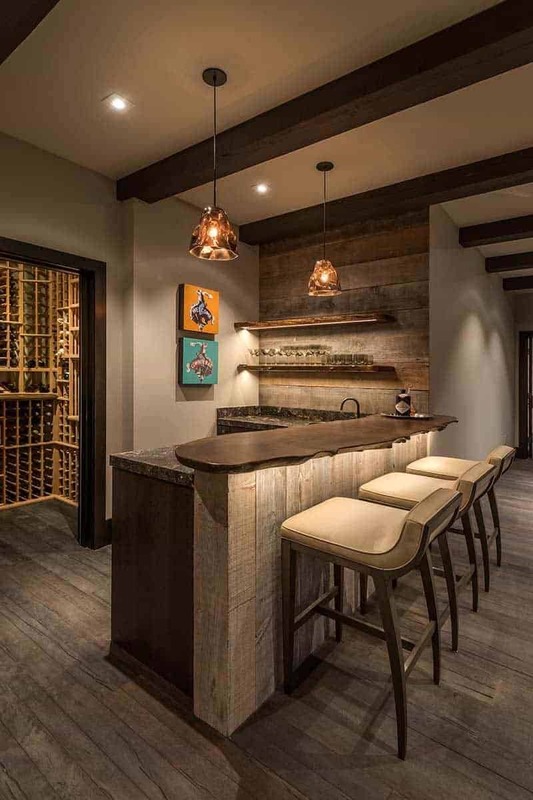 Barn wood has been used on the cabinetry, while the countertops are granite and Caesar Stone. 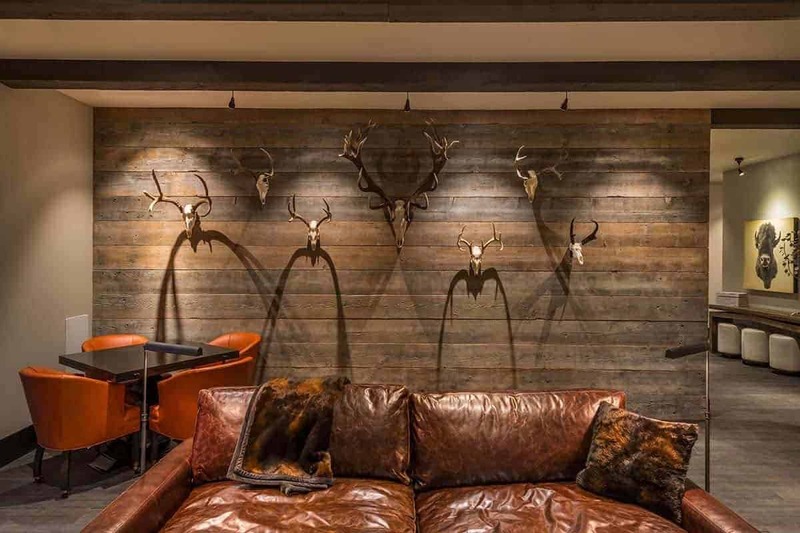 Barn wood has also been featured throughout the interiors, on the ceilings, walls accents and for barn doors. 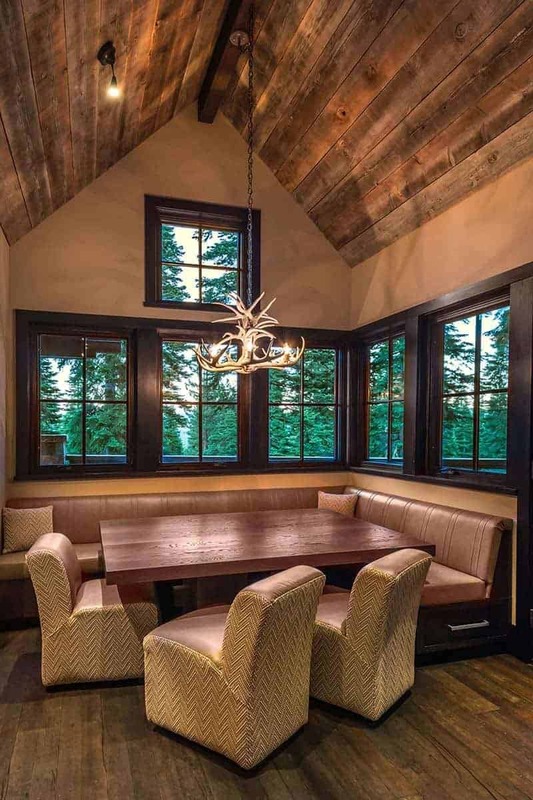 Above: Positioned between the kitchen and the wraparound deck with barbecue kitchen, smoker and covered/heated dining room, is an oversized corner nook that’s ideal for sunny morning conversations and late night board game marathons. 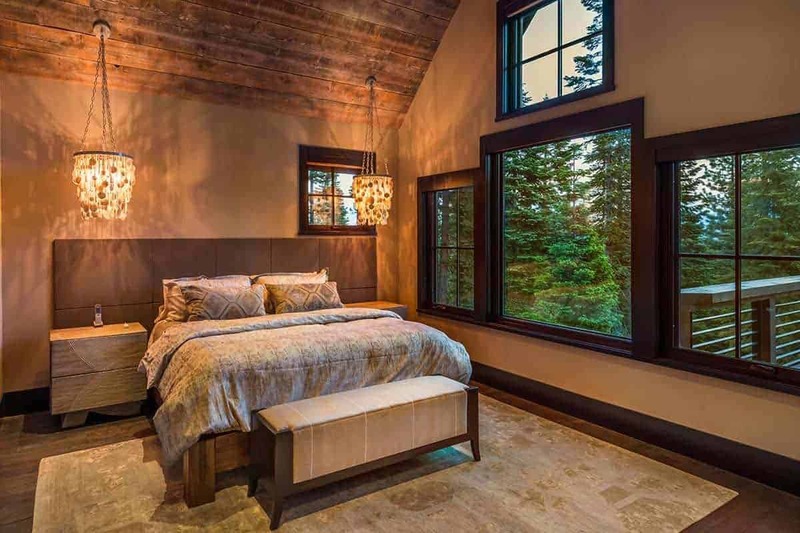 Above: The master bedroom is situated on the main level and has plenty of highlights including a fireplace, sitting room, private deck access and tree top views. 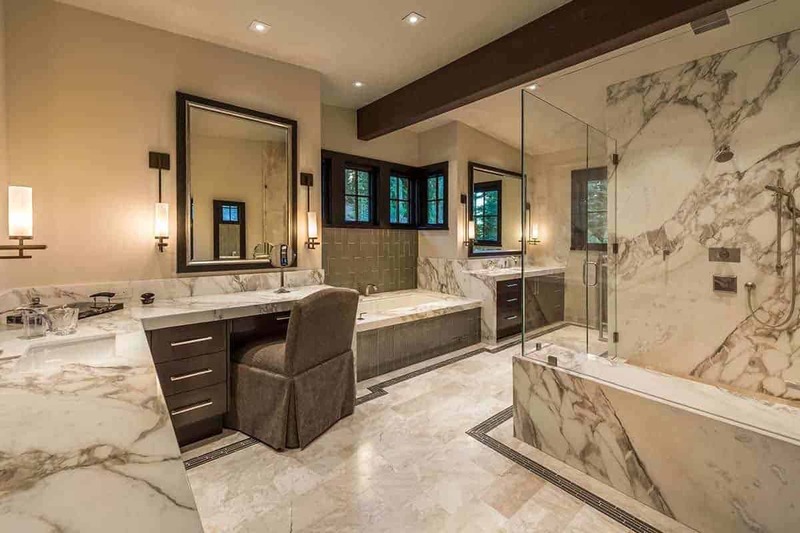 Above: The spacious his/hers master bathroom is a bright and elegant display of quality. Above: On the lower level there is an office nook as well a bunk room that is connected to another bedroom by a Jack-and-Jill bathroom. 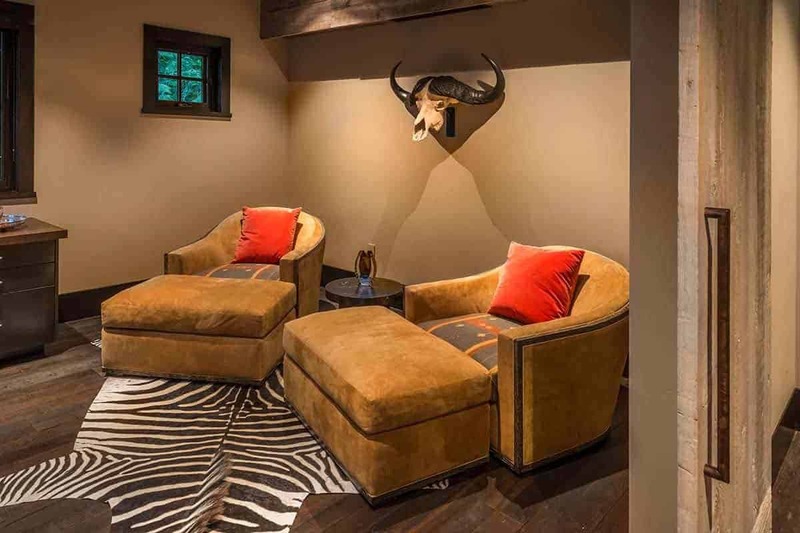 There are two more guest bedroom suites here as well as an expansive great room with a fabulous bar, wine cellar and fireplace for cozy nights indoors. This lower level opens out a covered patio with a beautifully manicured lawn, hot tub, firepit and serene forest views. 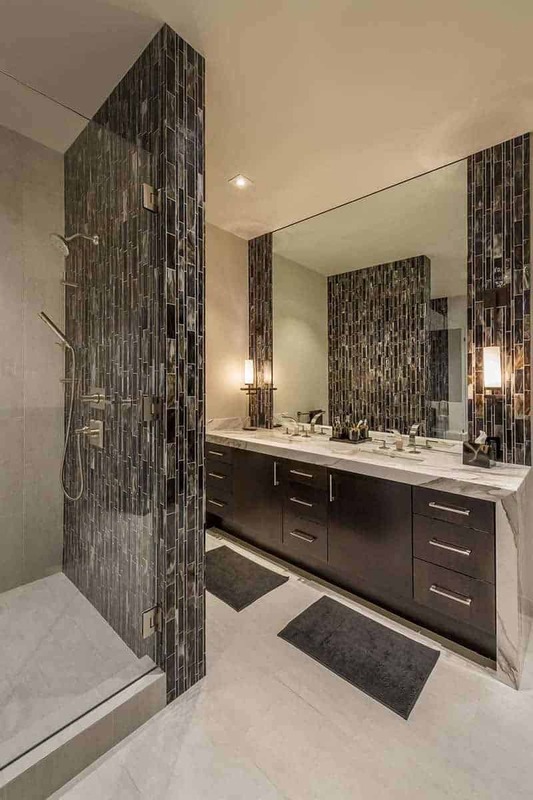 From this level, you can either opt for the stairs or elevator to get to the upper level, encompassing a large office with inspiring windows and a bedroom with idyllic forest views.